When a course gets updated, management can get touchy about what to call the work — a renovation, a restoration, maybe a reimagining. Alan Owen knows what he calls the work he and his colleagues did to Pinehurst (N.C.) Resort’s No. 4 course, for which he was lead superintendent. 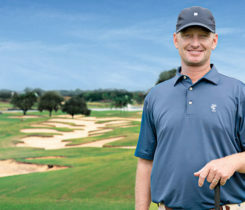 Hanse, designer of the 2016 Olympic Golf Course in Rio de Janeiro, envisioned No. 4 as a “companion course” to its famed sibling, No. 2. 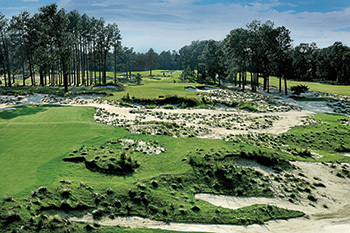 Recognizing the seamless connection, the United States Golf Association named the two courses hosts of the 2019 U.S. Amateur. Although No. 4 will be a natural counterpart to No. 2, it is not a duplicate. In fact, Hanse believes No. 4 features the most interesting topography on the entire property. Hanse equated redesigning No. 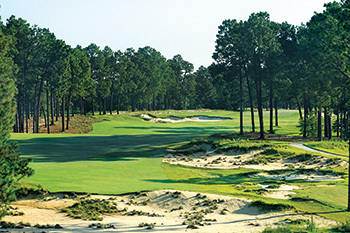 4 as a chance to “play in the sand,” as nothing in golf compares to the Sandhills region of North Carolina and its underlying soil. His team restored No. 4 to its original landforms by recreating the hole corridors and reconnecting the elevations and natural features. No. 4 closed in October 2017. The first stage was all in-house work: tree removal, cart path removal, trying to salvage as much fairway grass as possible, mowing down rough. Beginning last November, Hanse Design came in, along with LaBar Construction, a small crew just to get work started. In January 2018, everything ramped up. Work was completed just last month. Hanse told the assembled media at Course 4’s national media day event that this was inspired by Course 2. Hanse encouraged his team to visit No. 2 every day and appreciate the subtleties of the course — how fairways bleed into wire grass, and wire grass then bleeds into trees. There were some challenges along the way, of course. Material movement was the biggest headache. After these “frog-chokers,” the crew would return and do a little choking themselves… they’d see their hard work washed downhill. Hanse, who Owen calls “superintendent friendly,” didn’t want to leave the crew with a monster to maintain. So they did some recontouring and incorporated Centipedegrass into the layout. The result is a spectacular course that looks daunting but plays fair. The fairways are generous, like No. 2. There are some spectacular vistas. From the 6th green, golfers probably can see 70 to 80 percent of the golf course. Owen’s parents came stateside from Southampton, England, for a visit. But despite their son’s hard work on No. 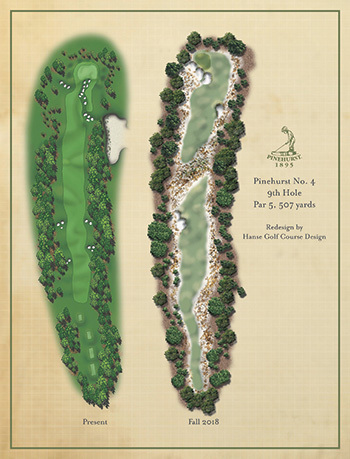 4, they elected to play The Cradle, a 789-yard short course built by Hanse Golf Course Design last year. That’s more their pace, he laughs. Owen, who was the superintendent on No. 6 and No. 8 before being pulled off those courses to lead the No. 4 work, came away from the whole experience honored and impressed by his co-workers. A fond memory of the project for Owen will be how Hanse built camaraderie among the team. Hanse held an afternoon golf outing on No. 4 for Owen, Golf Maintenance Manager Kevin Robinson, CGCS, and Assistant Superintendent Daniel Whisenant, along with the lead men from LaBar and the Hanse design/shaping team during construction. Afterward, Hanse invited everyone back to his house for a cookout and cold beer. Now that the course is open for play and receiving positive reviews, the cast of characters is happy — yet relieved — that the project is complete. 1 Comment on "Fantastic No. 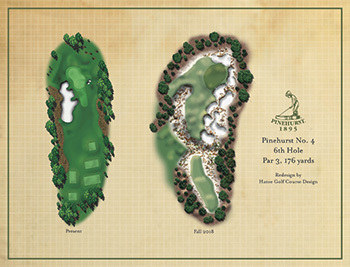 4 at Pinehurst Resort"